Are you shopping around for the best crutches, but you are too busy to compare all the models available? We offer here the most useful info for an informed decision. We compared the most popular products, so you don’t have to, and our research identified the Hugo Mobility 721-785 as the model with the highest score around. Because they are made from anodized aluminum, these crutches are extremely lightweight, and you can use them anywhere you want. The crutches are adjustable, and it is easy to use the push buttons to customize them for your height. 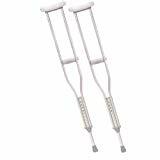 The particular design protects them against wear and tear, so you can rest assured that these crutches are an excellent investment. In case the Hugo Mobility 721-785 is no longer available, we have another model that we would like to recommend, the Drive Medical Tall Adult, that is almost just as good. 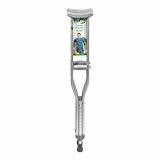 This type of crutch is crafted from aluminum, which means that it is both lightweight and easy to carry around. It can support a maximum weight of 300 pounds, so that’s one thing you need to consider. If your height is between 5’2” and 5’10”, you can definitely get the most out of this product. Push buttons allow you to adjust the model as per your needs. You might find it painful to use such a device if you’ve recently undergone Achilles’ heel surgery. A quality set that comes with underarm pads, so it is very comfortable to use, too. Even though they don’t cost a pretty penny as some of the other models we’ve gone through, these crutches boast a user-friendly design and have excellent durability. They are comfortable and can be used effectively since they come with hand grips. The center tube boasted by the models is double extruded, so the weight of the user will press on a durable component. The rubber at the bottom of these crutches can be a little slippery the first few times when used. You can adjust the crutches using the push-down buttons. This model works for people up to 350 lbs. If you’ve sustained an injury right below the knee, you can definitely make the most of this type of product. It is not designed for those individuals who have to sustain most of their weight using crutches, but it works for minimal injuries. The size is universal, and the crutch can be used either for the right or for the left leg, depending on your specific needs. The padding under the knee can become too stiff and hard after you’ve used the crutch for weeks. A convenient and universal type of product that can be used for people with injury below the knee. If so far you had no luck to get some good crutches and you don’t want to risk any more money on products that will not satisfy your needs, we have here a shortlist with all the popular models that are worth the money right now. The Hugo Mobility 721-785 is a model that is all worthy of your attention. Wood crutches are usually an excellent choice, but they are not as lightweight and versatile as these crutches are. Made from aluminum, they are capable of supporting a person weighing up to 300 pounds. They are durable and versatile, at the same time. If you have been looking for some great granddad gifts without managing to choose one, a pair of crutches like this one is a fine choice. They are made for an adult’s medium height, and the great thing about them is that they can be adjusted. People with a height from 5’2” to 5’10” can benefit from these crutches. The adjustment is done with the help of push buttons that are easy to operate. Another thing that you will like about them is that they are built to last. The crutch tips are curved so they can provide excellent traction when you’re climbing stairs. Also, the metal rings at the tips ensure that no sign of wear and tear will appear soon. The underarm pads are cushioned, to provide extra comfort for the user. The hand grips are resistant to perspiration and also easy to wash. These are cheap crutches that will help you move around with ease, due to their special design and excellent durability. They are comfortable, and they offer hand grips so that you will not have any trouble when you try to get from one place to another. The center tube used for the making of these crutches is double extruded, which means that the areas where more of the user’s weight will press down are reinforced and can withstand more wear and tear. They are made from aluminum, so they are stable and durable. Aluminum is lighter than wood and offers other advantages that must be mentioned. First of all, this material is more durable, and that means that you will make a sound investment, should you decide to choose them, not others. The underarm pads are comfortable, and they are latex-free, so there is no risk of triggering allergies. The push-down buttons allow you to adjust the crutches as you see fit. Using one-inch increments, you can slowly adjust the height of the underarms to a comfortable level. The hand grips can be changed without any need for extra tools. The total weight capacity is 350 pounds. This crutch has a unique design that makes it stand out. It doesn’t require you to use your arms and hands, and that gives you more freedom. Many crutches reviews written by users and experts praise this model for the extra advantages it brings to people who need help to walk. You need, however, to pay attention to what sort of situations such a crutch can be useful for. People with injuries below the knee that do not require you to support your entire weight on the crutch can benefit from it. This unit offers you the possibility to walk your dog, or grab a cup of coffee, while still being able to move around. The size is universal, and most people can use it. The crutch can be used for the left leg or the right leg interchangeably, so you will not have to worry about finding the right fit. The iWALK2.0 Hands Free is a Class 1 mobility device that can be used in a broad range of situations. The company making this model offers plenty of videos and instructional materials so that you can easily fit the crutch on your leg. Another excellent choice you should bear in mind is the Drive Medical Euro Style. With a weight capacity of 300 pounds, this model can be used by many people who have their mobility impaired due to age, and other circumstance. Because they are made from aluminum, they are incredibly lightweight. The model is so sturdy that the manufacturer offers a limited lifetime warranty. The unique design involves a molded forearm cuff with hand grip for comfortable use. The height of the crutches can be adjusted using one-inch increments. This way, you can be certain that the crutches will fit like a charm. You can use senior exercise equipment when you are inside, but if you want to go for a walk, it is never a bad idea to get a pair of crutches like this model. Other models with a similar design are heavier than this one. Each crutch weighs just 1.5 pounds, so you will find them comfortable for moving around. You can pick from a variety of nice looking colors, depending on your preferences. These crutches are safe to use, and you will not have to worry about a thing while using them. Everything you need in a pair of crutches you will find in this model. The PCP Push Button is an excellent choice, and it doesn’t compare to other senior walkers that you can see on the market, because it is simply better. The crutches come already assembled, so there is no guesswork involved here. You will receive complete usage instructions that will help you make the most out of them. The push-down buttons are there for easy adjustments, so you can use the one-inch increments to make the crutches fit your height with great ease. The model is available in the tall size and regular size, so pick the one that is the most comfortable. You may also purchase a model for kids or the junior youth version for older kids. These crutches are ideal for recovery. Injuries to the leg or foot area, including ankle and knee damage, can be helped on the path of getting well, by using this model. Seniors can also use them after surgery, and other medical interventions, as well as every day. The weight limit is 300 pounds, which means that they are an excellent choice for many people. For temporary and everyday use, they are a good alternative to other models on the market. The Drive Medical Forearm Crutch is a model created with the user’s comfort in mind. At the same time, they offer excellent stability, so you don’t have to worry about your safety, either. The arm cuffs are contoured to provide extra comfort, and the crutches are vinyl-coated for maximum durability. The legs and the forearms can be adjusted separately; this is an important step forward from models that only allow you to change the overall height of the crutches without extra features. With a weight capacity of 300 pounds, these crutches are excellent for someone whose height is anywhere between 60” and 74”. One of the things you will surely like about these crutches is the large size of the tips. When you put the crutches down, this simple detail offers extra stability, which means that you don’t have to worry that you might get injured by incorrect use of your crutches. The excellent ergonomics of these crutches recommend them for everyday use. You will feel comfortable while walking around, and you will not have to worry about your crutches needing a replacement anytime soon. Stable and durable, they are an excellent choice. This model is more than just a walking stick, and that shows in every detail of the design employed by the manufacturer. The center post does not allow you to rotate each crutch too much, so you will always have the push-button mechanism in sight. No matter how often you need to adjust your crutch, it will be easy to do so with the help of this configuration. The stair deflector feature is a great thing for people who are concerned about their safety. The crutches will not slip when you climb stairs, and the stress points are reinforced so that you can put your entire weight on the crutches, without fearing that they might break. These are designed for a user’s height between 4’6” and 5’2” and they can support a maximum weight of 300 pounds. You will get stability, durability, and other advantages if you pick this model over others. For instance, the rubber tips make sure that you get plenty of traction so that you can move around with ease. The durable rivets are used to stabilize the aluminum tubing used for the crutches. Therefore, you gain more stability than when using plastic connectors for the same purpose. Some people do not have enough space in their homes to keep a pair of crutches, or just do not want to keep them somewhere where there would be a high chance to get damaged. They can pick the Carex Folding Crutches and get rid of such issues. These crutches can be folded and stored away conveniently. The crutches come in a universal size, and they can be adjusted for easy use by adults, teenagers, and even tall people. They are an excellent choice for anyone who wants to recover from an injury. The comfort grips and pads come in a nice sporty blue color. If you need to travel, they are an excellent choice, as they will fit easily under your car seat. When you want to have dinner in a restaurant, it will be easy for you to tuck them under the table. The crutches can be adjusted for a user with a height from 4’11” to 6’4”. Now you no longer have to worry that your mobility problems will keep you inside. It will be easier to see about your day as you would usually do if you have a pair of crutches like this one to help you move around. You will find these crutches to be very comfortable and durable, two important considerations when you want to make sure that you are getting a good model. Your mobility doesn’t have to be affected regardless of whether you are recovering from an injury or you need support on a regular basis. These crutches come equipped with a convenient mechanism for adjusting them as you see fit. Their total length can be customized at any value from 44 to 52 inches. Adults will find them particularly comfortable, and they are not a good pick for other categories, such as children. Made from durable aluminum, the crutches can support up to 250 pounds so that average adults can make good use of them. The comfortable pads will make your life easier, and the durable tips will not wear off quickly. You can rest assured that these crutches will help you on your path to recovery. When you need to get back on your feet after an injury or surgery, you will discover that these crutches can be of great help. The hand grips will allow you to balance your weight and move around without being hindered too much. Crutches are available in various models and configurations, and it might be a bit challenging to decide which product is the right one for you. Depending on the purpose you need the crutches to serve, and your preferences, you should pay attention to certain aspects. We compiled them all here, for your use. The most common are forearm crutches and underarm crutches. There are also hands-free models available, and some even consider them the best crutches for non-weight bearing. Let’s take a look at all these configurations, so you can quickly tell which ones would be the most suitable for you. Just like when you’re shopping for a handicap toilet, you must pay attention to details. Underarm crutches are an excellent choice for people who need just temporary help for recovering from an accident, or surgery. They will allow you to rest your weight on the crutches, so you can move around without overexerting yourself or the area of your body that needs recovering. A downside to such models is that they tend to create a habit of slouching that will not be easy to get rid of afterward. Coordination is, however, ideal, and overall, you will find that these crutches are easy to use. Forearms crutches have their fair share of advantages. For starters, they are praised by the reviews of crutches for long term use, because they help you build muscle mass, as more strength is required to use them. However, they are not as easy to use as underarm models, and they need you to get a little time to grow accustomed to them. Hands-free models have limited use, but they are ideal for people with below the knee injuries that still want to be able to use both their hands. During recovery times, such a crutch can prove extremely helpful. If you want to purchase a pair of crutches, one thing you should learn about the various models on the market is what materials are used for them, and how much weight they can sustain. You will notice that the durable models on the market are usually made from aluminum, a lightweight material that can support quite a lot of weight. Depending on the weight of the user, you need to focus on the models that can accommodate them. If the person you are buying the crutches for has several health problems, and they need the best comfort possible, start by providing them with a pair of crutches that can support their weight. The products on the market vary a lot. Some can support only 250 pounds, while others can support up to 350 pounds. The aluminum construction is ideal because it is lightweight and durable. Maybe it will take a bit more to find the perfect model, unlike picking a wheelchair cushion, but your efforts will not be in vain. You can find the ideal fit if you focus on comparing the various adjustable models on the market. The manufacturer will specify the height limits, and what adjustments are available. Usually, a push-down button will allow you to adjust the height of each crutch for your maximum comfort. When you search for the best crutches for hip surgery, you may want to look for adjustable crutches, too. The more comfortable your crutches will be, the speedier your recovery will be because you will not add extra strain on your body. Forearm models that are top of the line will even allow you to adjust the length of the forearm part and not only the leg of the crutch. Seniors need products that are suitable and specially designed for them, from incontinence underwear to the crutches they need to move around. One aspect that you should never overlook is stability. Check for models that come with large tips and also a stair deflector design. These crutches will allow you to climb stairs without fear that they will slip, and they will make sure to support your weight without a problem. Non-slip rubber tips are a must, too, and metal rings at the tips will prevent wear and tear.